food: breakfast | eat. drink. fly. i have long complained of a lack of decent breakfast in the suburbs. it seems to me there is only 2 choices. either is greasy and disgusting like IHOP or a greasy spoon… or its a chain restaurant like milestones or browns or whatever and so painfully uninspired. i crave the breakfasts of the city. vancouver is a breakfast city. every saturday and sunday, restaurants are packed to the brim and lined up outside with devotees. there is no room in the vancouver breakfast scene for a mediocre offering. it simply would not survive. we’re more fruit than greasy hashbrowns. turkey sausage options is a must. turkey bacon is so 2005.
and if your eggs aren’t free range, then you have some explaining to do. salmon finds its way into everything, beyond the west coast special smoked salmon benny… its in omlettes and other applications that we see as so normal, but tourists find quirky. yes, vancouver loves its breakfasts. and yes, we are snobs about it. the coffee must be from fair trade organic beans… and if its not french pressed, well, it’ll do… if thats all you have. are your potatoes local? they’re in season, you know. is the bacon house cured with no nitrates? and what farm are the pigs raised on? is it within 100 miles of here? i joke, but not really. we are a city of food snobs. but i can’t fault us for it. we expect the best quality when dining out and don’t settle for anything less. and i think if more people thought about their food that way, we’d be in a better place as a society. respect for food translates into respect for yourself. it stands to reason that if you have standards about what you’re eating, you won’t find yourself scarfing fast food or junk food. you’ll take the time to think about the chemical cocktail of what you’re actually consuming. until recently, whenever i wanted breakfast out, it always ended in frustration. like i said off the top, its all either super unhealthy or super lame. option 3 is chinese. there is some spectacular dim sum around my area. but again, super unhealthy. i honestly can’t eat it anymore, it just makes me ill, no matter how good it is on the way down, it culminates in the rest of the day being miserable and full of regret. breakfast is also tough for me because i’m not really an egg lover. the idea of an egg on its own… like sunny side up, is gross to me. eggs smothered in hollandaise sauce? well, now i’m interested. but i still like them poached hard so the yolk doesn’t dilute my delicious sauce. as well, since i ditched the bread, eggs are even less interesting. i mean, wasn’t the best part sopping up the runny yolk with your toast? basically my breakfast of choice was often toast, meat and fruit. not a big potato lover, especially when its those “breakfast french fries”. if its deep fried, its not a hash brown, okay? 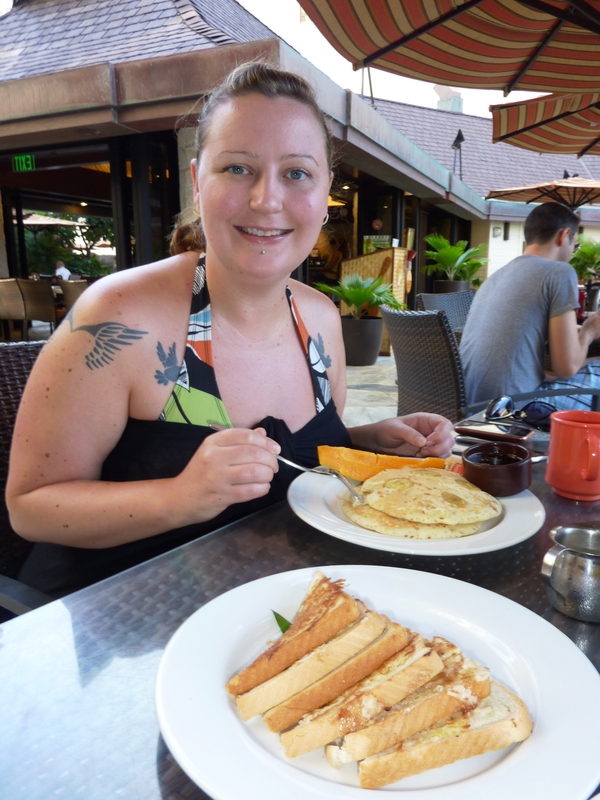 to me, my favourite breakfast ever is in waikiki. at the Kani Ka Pila Grille poolside at the outrigger reef on the beach. i ate here almost every morning for 10 days and bitterly regretted the days i chose other destinations. 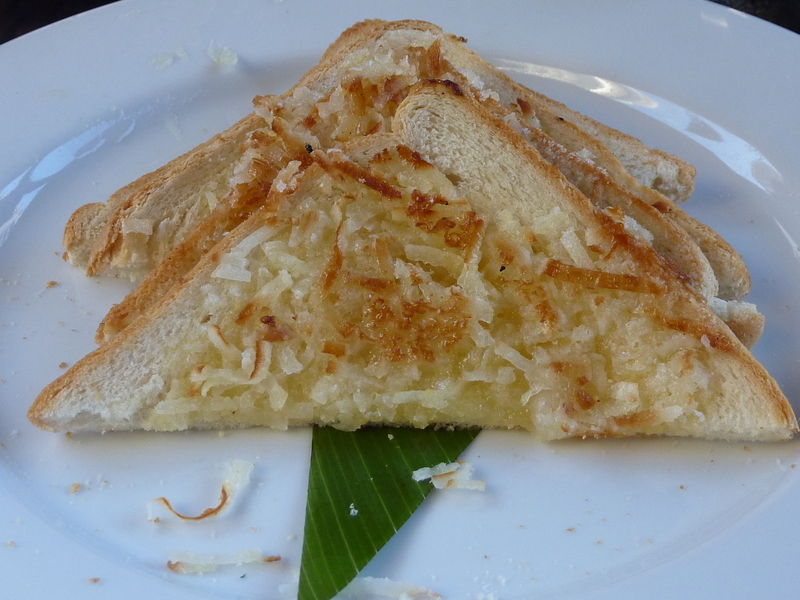 the devil that tempted me most here was the coconut toast. try to imagine… as a (now recovered) carb fiend and a coconut obsessed girl, this was my perfect breakfast. in fact i was quite certain i could happily live off this and only this until the end of days. slathered in coconut oil and coated with fresh coconut and then grilled face down on the flat top. 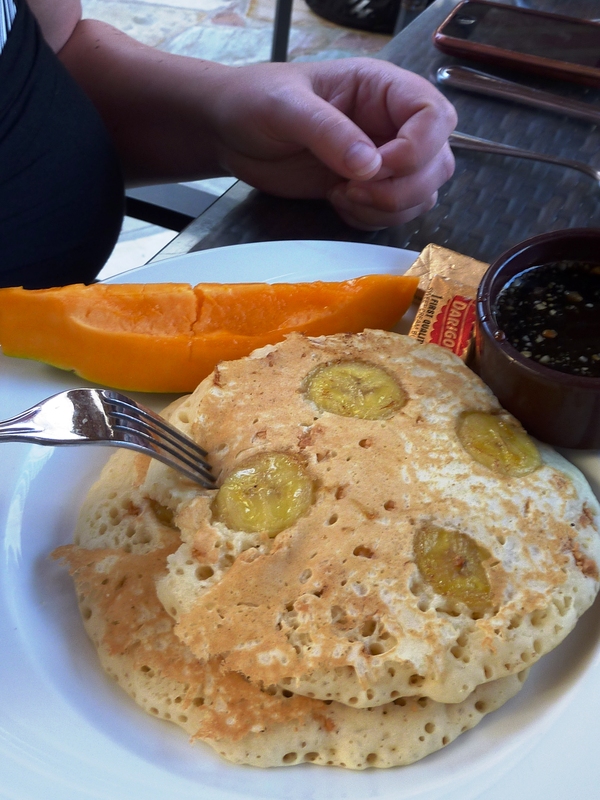 my other breakfast obsession at this place was their banana pancakes. weird, because i’m not a real banana lover. nor am i a pancake lover. but its safe to say that the hot macadamia nut syrup was the clincher. naturally, the fact that everything was served with a luscious piece of papaya was just icing on the cake. i adore the tropical fruit in hawaii. i have finally stumbled upon a suitable option right here, only a few blocks from my house. 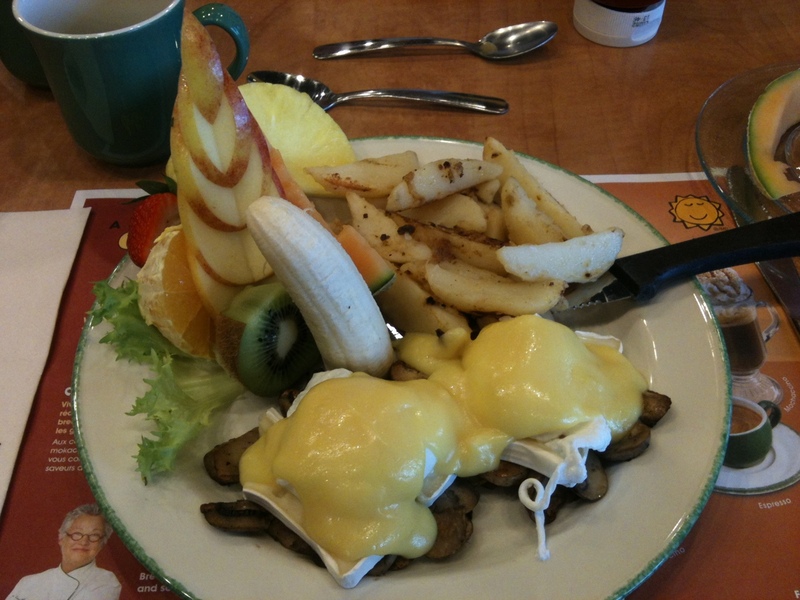 the place in question is Cora’s and they call themselves breakfast enthusiasts. which i dig. but most of all, i dig that there’s nothing deep fried in the whole joint. and that everything comes with an absolute mountain of fruit. i love that there’s a fruit cocktail of the day that changes constantly. i love the slight quebec twist on all the foods, heavy on the crepes. i just straight up love this place. the only negatives about it is that i find the wheat-free options few and far between. this is the mushroom & brie benny. but i like the asparagus one too. but sometimes i get tired of modifying menus. so i just cheat on my no-wheat and regret it later. this is one of my other faves. its delicious lean sausages wrapped in cheese & buckwheat crepes. i can never finish this meal. i get through 2 sausages and half my fruit and pack up the rest for the next day. two breakfasts in one, and not an egg in sight. 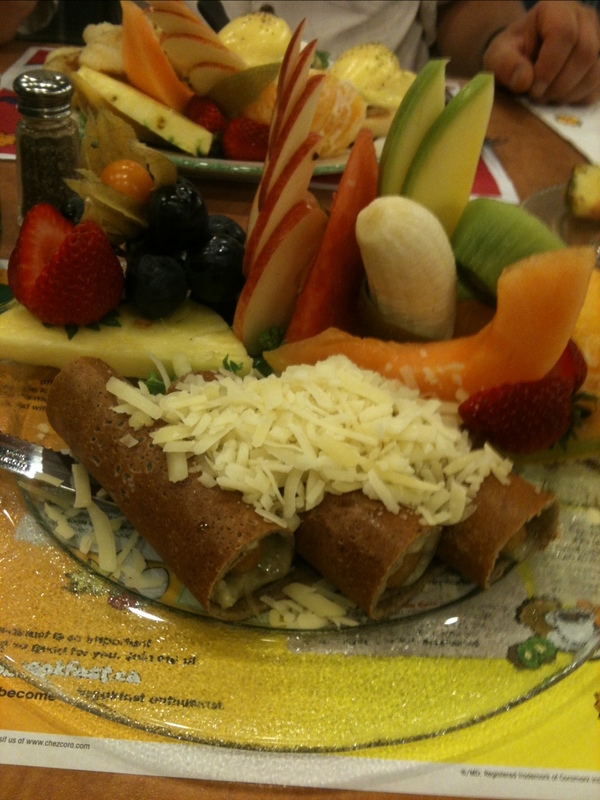 thanks cora’s for making me believe the suburb breakfast can make the cut.